Back before I worked at Premavision Inc. on the Gumby TV series and the Gumby Movie, I was deep into the special effects make up field – or at least I had aspirations of making a career of it. 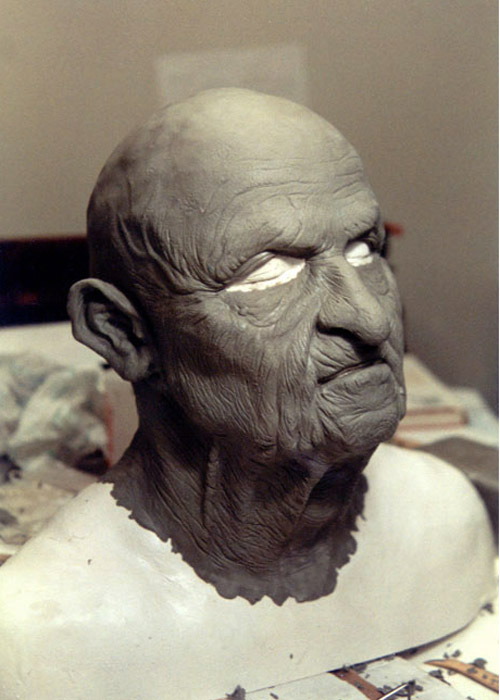 I had enjoyed sculpting from an early age and as a young teen I had begun to research the creation of monsters and the transformation of actors into incredible characters that appeared in many live action films of the day. 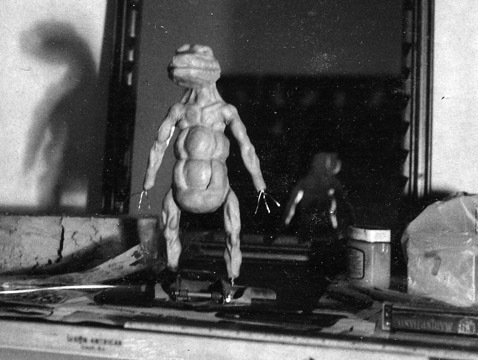 I was also inspired by the fantastic and fanciful films of Ray Harryhausen — so, much additional time was spent researching stopmotion puppet making. 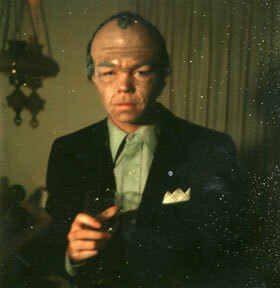 This was a late 1970s attempt at an old-age make up on long-time & best friend, Dan Morgan. 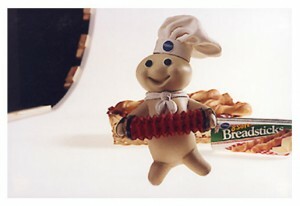 The receding hair line was achived by soaping his hair and a nylon stocking cap covering. The cap was also soaped and dried and covered with flesh-toned grease paint. Some of Dan’s own hair was pulled through a slit at the top of the cap and we removed the back half of the nylon cap leaving his hair exposed, streaking it with white hair coloring to add to the effect. 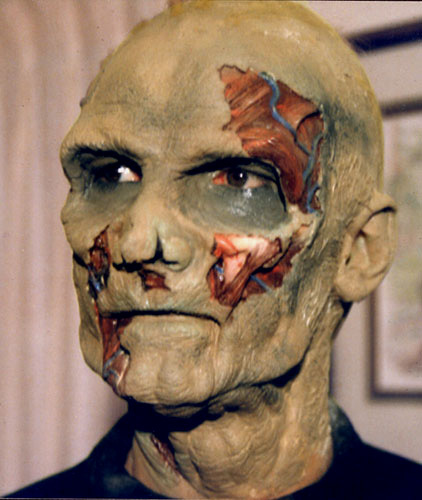 Bags under his eyes and jowls around his mouth was done using the cotton and latex technique used by make up artist Jack Pierce on the Frankenstein monster in 1931. Kind of ended up resembling Nixon unintentionally. Dan was probably about 12 or 13 years old then. 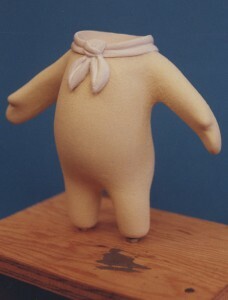 Eventually I tried sculpting a likeness of Dan from photographs. The picture on the right is an unrelated time where I was painting on some spirit gum for another make up experiment. To this day Dan and I occasionally work on FX make up and puppet making for local theatre and independant film projects. 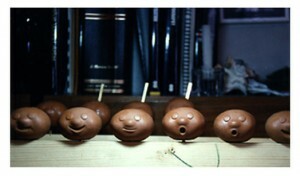 Below are photos of my attempt at creating a stopmotion puppet. 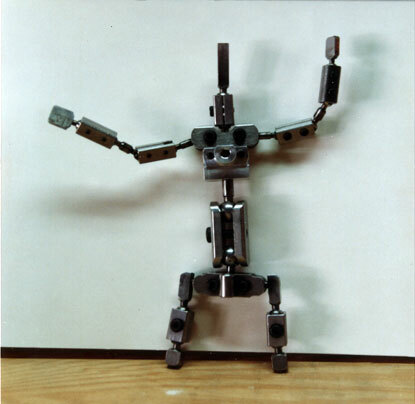 This aluminum wire armature was built by another long-time friend Dan Baldocchi, a stopmotion animator and FX man that introduced me to many film industry veterans and was also instrumental in helping me land my position on the Gumby projects. Mr. Baldocchi was kind enough to fashion a ball and socket jaw for this lizard-like character. 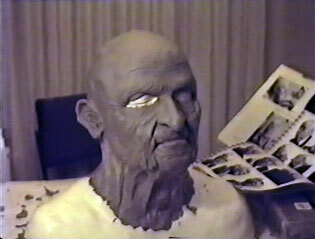 My final sculpt appears below. A foam rubber puppet was eventually made by Dan Morgan and I, but regretably, I never really had an opportunity to animate it for more than a few frames. Dan and I were comissioned to do horror and gore, this one in the tradition of the Zombie genre. 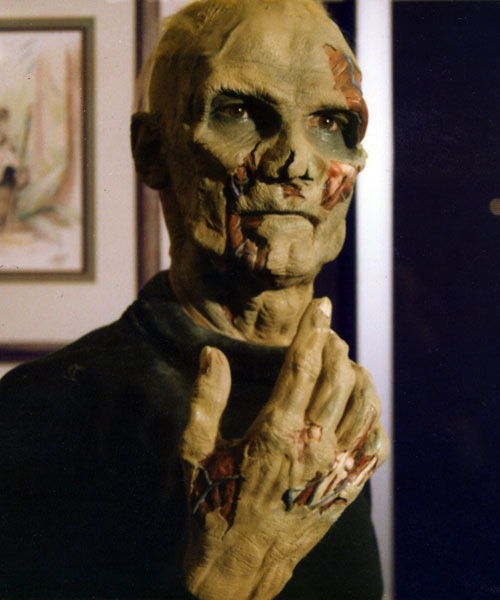 In a never completed 1988 indi film called “7 Stories to Hell”, an anthology of short horror tales, this make up was for a short segment called “The Stranger” – a cursed man who seeks out candidates to kill by dissolving their insides using a rare elixir and leaving only the flesh. He does this to replace his ever-decomposing skin. The actor shall remain anonymous. 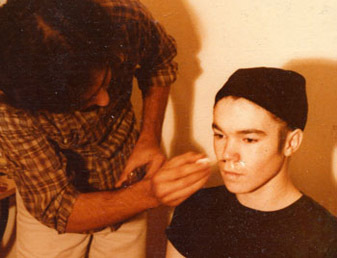 The next makeup is a popular challenge to many makep artists just starting out. 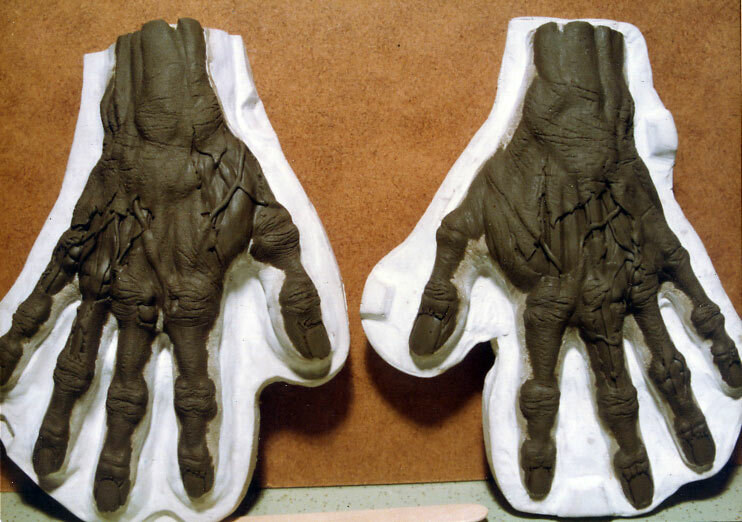 Duplicating the techniques used in the original “Planet of the Apes” series of films was considered FX Makeup ‘101’. It’s a deceptively difficult one to pull off because the characters are so recognizeable to most people and to do a replica of “Cornelius” or for that matter any of the main characters, it takes a bit of effort. Dan Morgan does a great Roddy McDowall impression. 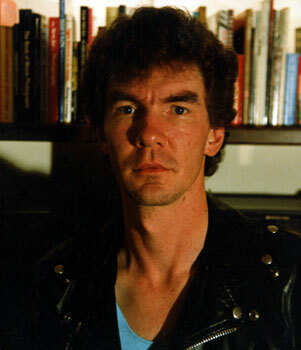 Together we won 1st and 2nd place awards at several comic conventions during the late 70s and early 80s. This version was another comission in the mid 80s for Paula Crist who was stunt woman in the “Conquest of the Planet of the Apes”. She hired Dan to partner with her as Cornelius and Zira in promotional appearances for 20th Century Fox and Martin Marrieta (now Lockheed Martin). 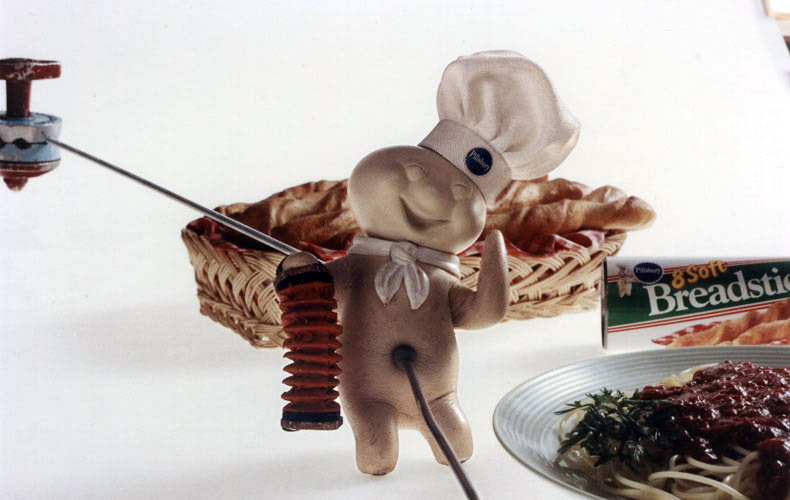 Fast forward to 1990 when Dan and I were hired at Colossal Pictures to work on a series of one the last Pillsbury Dough Boy campaigns to be stop-motion animated. I helped with sculpting the replacement heads, seam and paint the puppet body, make props, such as the concertina, etc. Dan helped make molds and cast the replacement heads. 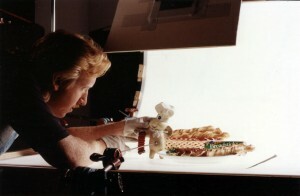 Animator, Mike Belzer is seen below working on the “tickle” scene. The ball & socket armature also appears below. 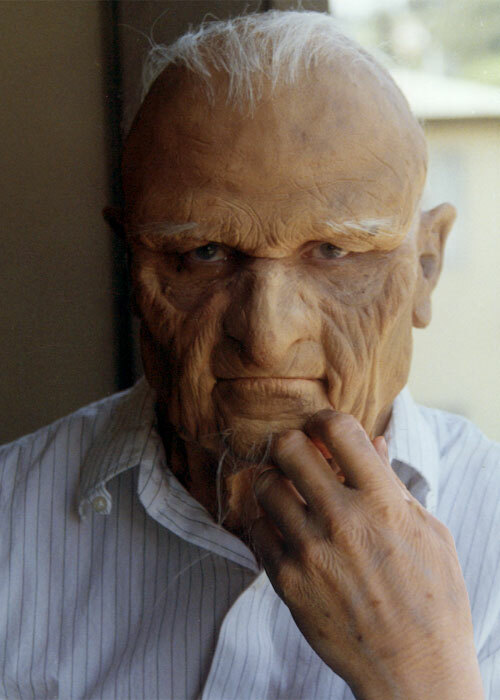 During the mid 1990s we did another old age make up on Dan. This time using overlapping prosthetic pieces made from foam latex. 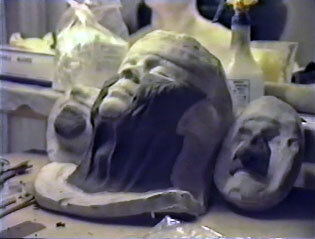 Here are a couple of shots of the plasticine scultpure over a head cast of Dan. The following two shots were taken after the make up had been warn for a day of performing in public. The next couple of images are video captures of the nearly completed application. 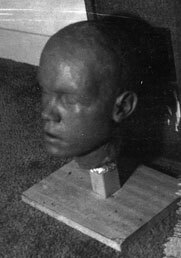 We first got a head cast of Dan Morgan. I had a crew of 3 people working with me to prep Dan and to keep a flow of plaster bandages coming. My main help came from Chuck Jarman who assisted me in all the carefull alginate coverage and the application of the plaster bandages, including the many steps throughout this project. 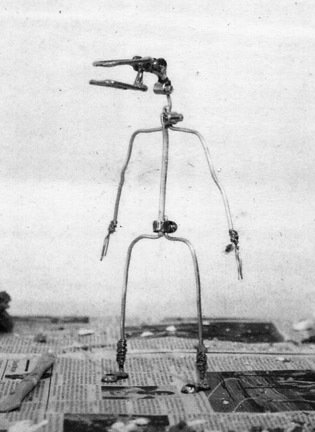 Here’s the sculpture. It took less than a week to do and with Chuck taking on the back of the head and neck, the job was relatively quick. Dan Morgan took on the task of prepping the clay sections for piece molding – that’s the process where the sculpture is cut along strategic contures down to the plaster cast. 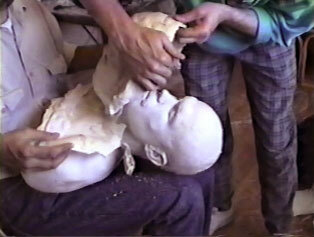 The head cast is treated with a gelitan substance that leaves a film before the sculpting begins. 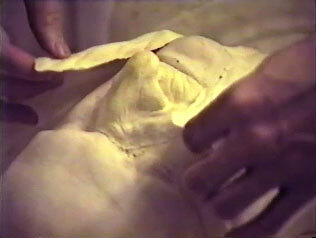 Then the entire plaster bust with the sculpture is soaked in water.The film dissolves and the clay pieces come away rather easily from the plaster and are transfered to duplicate castings of different parts of the face, like the nose and upper lip, neck and cheeks, forehead and back of the head. 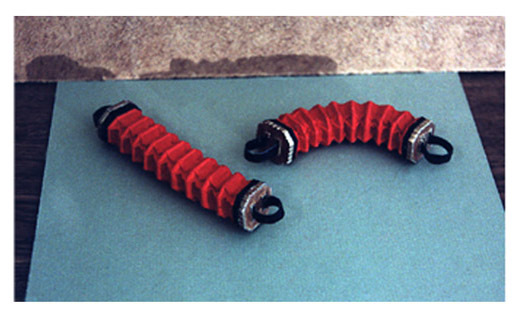 Dan Morgan did the majority of the piece molding process. 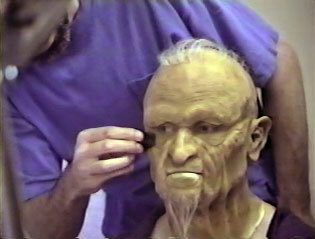 He’s a great technician when it comes to casting prosthetics. While I prepared the final touches to the sculpture on each face part, Dan worked closely on my heels and continued the casting process. We did all this work over one weekend. The precise science of generating the foam latex depends mostly on accurate weight measurements and whipping time – again Dan is the technician. 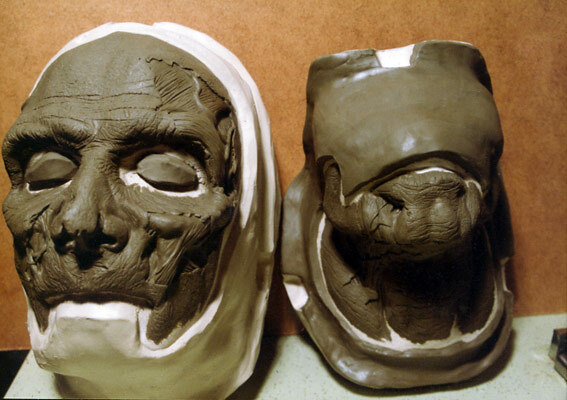 After baking the foam filled molds for 2 to 3 hours, the molds are carefully opened while still quite warm to remove the raw prosthetics. The molds need to stay warm to prevent the stone from cracking, that’s why you’ll see them wrapped in blankets and towels. 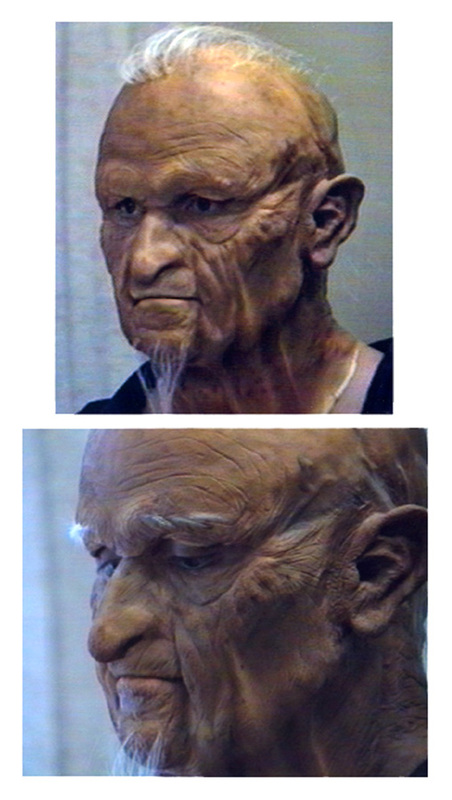 Chuck airbrushed a PAX mixture, measured precentages of liquid acrylics and prosthetic glue, onto the appliances as a base color. He also punched in the wisps of white hair on the head and chin with a specially made needle. Dan Morgan put in his gray tinted contact lenses to disguise his own hazel eyes. 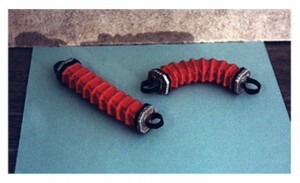 The application of the overlapping prosthetic appliances took almost 6 hours. Dan and I are both experienced at this process, so Dan was quite at home attaching some pieces himself. 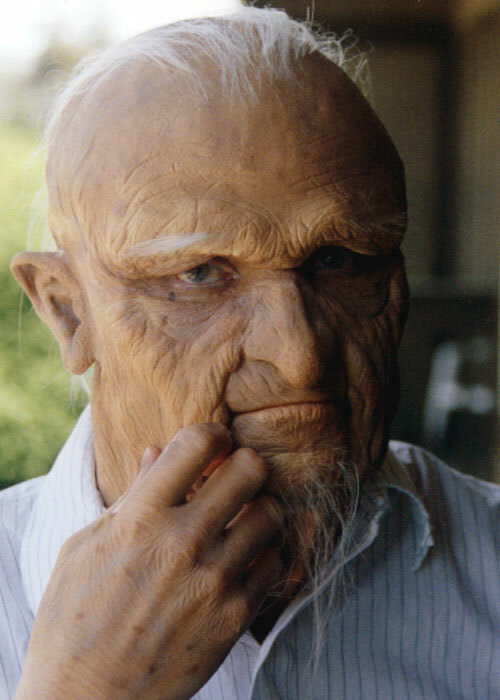 With all the edges blended and the final make up touches nearly completed, we focused on the hands and stippled on some special latex rubber to create weathered and puckered skin. Here is the video in two parts showing the process from start to finish. It includes a couple of clips of Dan Morgan’s performance. 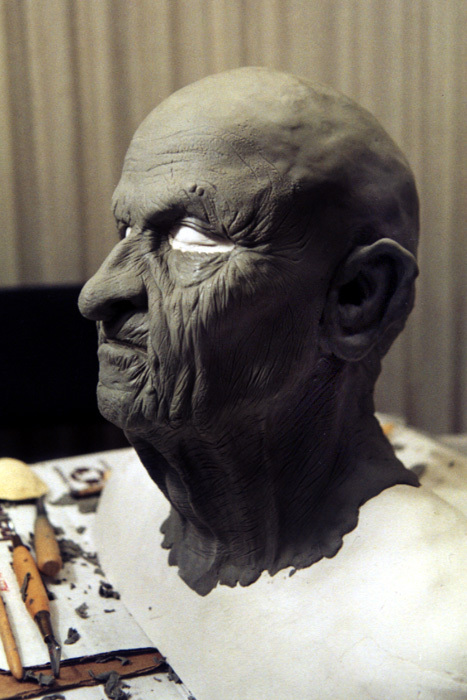 Be sure to check out BLENDED EDGE FX for more makeup, props, pupptes, etc. The website has addtional pictures, videos and updates on new projects!